We have moved our site to a new server. and we will do everything we can to resolve any issues. 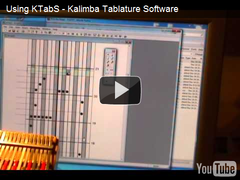 KTabS is our Kalimba Tablature Software that allows you to easily create kalimba music on your computer. Inspired by the kalimba tablature created by Mark Holdaway, KTabS helps you customize tablature for your kalimba and compose, edit, play back, and print out your kalimba music with simple clicks of the mouse. Register on our site and have access to hundreds of free KTabS music files! Play KTabS music for free with the play-only version of our software! Access hundreds more kalimba instructional files and music for KTabS! KTabS Version 1.0.13 now available! The KTabS Reader is now FREE!